A stones throw away from my Linton Crest, Bristow home you can find the final phase of development of homes in the Glenkirk Estates subdivision in Gainesville, Virginia. As of right now there are only 17 plots (8000-14000 sq. ft.) remaining to build your forever home. There are many models to choose from including the Abriel, Rowan, Celestial, Buchanan, Ash Lawn, Cartwright, Hartwicke and Monticello. The final phase of the neighborhood is located on Estate Manor Drive and Enochs Court. Buyers can still reserve a prime location in the cul-de-sac with private driveways or backing to wooded areas. Prices start at $527,900 for a 2700+ and range up to 4200+ square feet homes with modern floor plans that take away the underused formal rooms and replace it with usable indoor and outdoor space. The plans offer open space for families that feature large kitchens and adjoining family rooms. The four bedrooms are spacious and the Celestial model offers a first floor master suite. The builder (Drees Homes) provides top quality construction specs including low maintenance siding, aluminum wrapped trim, all vinyl windows with 10 year warranty on glass, tongue and groove sub-floors that are screwed in, wall tube pest defense system, energy efficient gas heating vent controlled dual zone system and much more. There are many distinguishable feature of the finished home both inside and outside. The elevations offer a prestigious appeal, elegant entry and a beautifully landscaped lawn. Inside the home on the main floor are 9' ceilings and traditional raised panel doors with brushed nickel hardware. All the kitchens are gourmet and fitted with maple cabinetry and crown molding, Whirlpool appliances, double wall ovens, electric cook-top, 25 cubic foot refrigerator and delta faucets. A finished Rec Room is also now being included in the pricing of these great homes. The main feature of these homes has to be that the community is in the final phase of development meaning there will be no more construction going on and you can see what the community looks like near completion. There are also many new and exciting developments in the area. 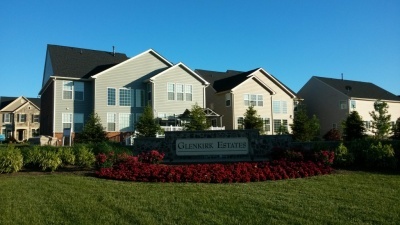 Glenkirk Estates community pool, clubhouse, picnic areas and tot-lot offers residents a variety of activities to enjoy within the community and the soon to be developed Rollins Ford Community park with all of it's soccer fields and trails are also within walking distance. Additionally, there is a plethora of dining and entertainment choices nearby at the VA Gateway Promenade and Atlas Walk. Lastly, HOA is only $92 and paid quarterly which includes all the amenities above and trash removal. If you have any real estate or area related questions or you're interested in buying or selling a home in Northern Virginia, contact or call Cleo 1.703.609.7407 & put our team of Northern Virginia home experts to work for you!